This article is about the original comic. For the Simpsons Comics One-Shot Wonders version, see Lisa Simpson 1. Lisa Comics was a one-shot comic, with the sole story being Lisa's Adventures in Wordland, a parody of Alice in Wonderland. It was released in April 1995, and issues were meant to be released once a year. 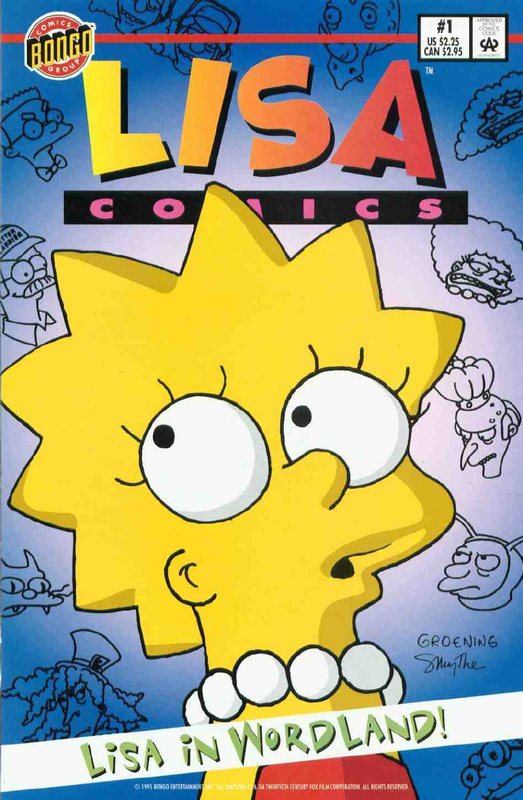 It is likely that the number of Lisa Comics #1 issues sold were low or that the character of Lisa was not popular enough to create a further line of issues which lead to Bongo Comics canceling the series. It was published in Australia in 2006 by Otter Press, in Germany in March 2006 by Panini, where 2,500 copies were published, and in the United Kingdom in 2002, the story split between two issues, Simpsons Comics #69 and Simpsons Comics #70. It was also released on The Simpsons Comics iOS app on July 12, 2012. "One poetry-slinging mailman, two palindrome-pummeling twins, sixty-five crossword-crunching questions, and a mischievous house cat are merely four of the uncountable and indefatigably extraordinary elements in Lisa Simpson's curiouser and curiouser comic debut!" Modified on July 25, 2017, at 11:01.